I'm looking for a reasonably direct, cost-effective (so, probably not taxi) way to get from Ljubljana airport (Jože Pučnik) to Lake Bohinj, ideally without going via Ljubljana which is the wrong way. It must be possible, but I don't know Slovenia and am getting lost amid all the different transport company websites. Google Maps estimates driving times to be a little over 1 hour, so I'm hoping for a route taking something between 1 1/2 to 2 1/2 hours, skipping the lengthy south-bound detour to Ljubljana, ideally costing less than about €50 total for 2 people. I'm hoping someone who knows Slovenia can suggest either a route, or a better way to find a route. It looks like it should be possible to get a bus from the airport to Kranj, then train from Kranj to Bohinjska Bistrica, then bus or taxi to the lake. 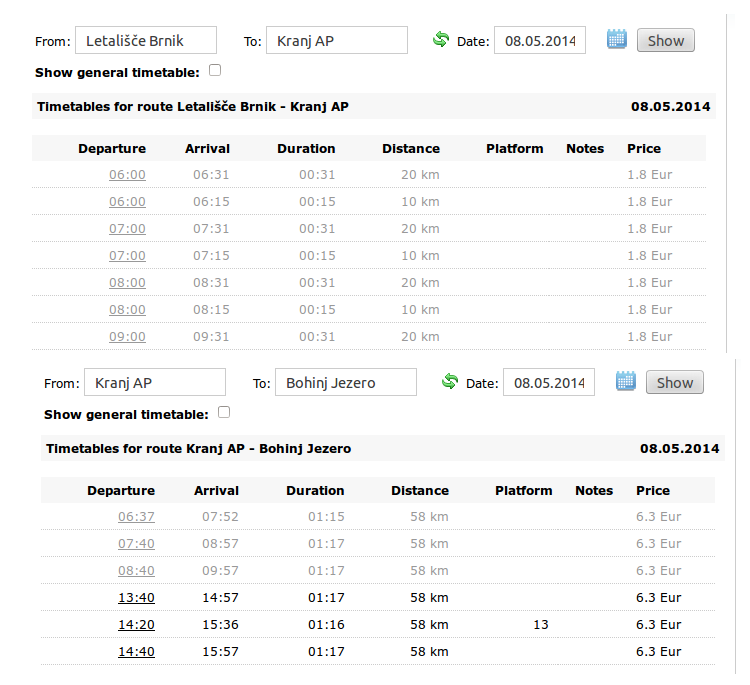 The train part is simple, it's between 1 and 2 hours changing at Jesenice and costs around €6 (bargain!) - but seemingly running only every 3 hours or so. The tiny bus transfer from the airport to Kranj is proving harder to research. I've browsed the bus options on the LJU airport site, which gives two companies with timetables that don't appear to show arrival times. Alpetour's English-language site doesn't appear to have the airport listed as an option (I've tried various combinations including Aerodrom and Jože Pučnik). EDIT after much trial and error I think that Ljubljana Airport is listed here as "Letališče Brnik" - if this is true (which I'm not at all certain of...) it would mean there are buses to Kranj every hour on the hour, taking 15 or 30 minutes, costing €1.80. The AlpeAdria line site only allows Klagenfurt and Kirschentheuer as options when "Aerodrom Ljuljana" is selected, despite the bus going via Kranj. They have no modern booking facility, just an old-style contact form. Lake Bled is a hugely popular destination on the Kranj - Bohinj route and not far from Ljubljana airport, so I thought it might be possible to get a simple transfer to Bled then continue from there. However I'm finding routes from the airport to Bled as difficult to find as routes to Bohinj. I'm sure I must be missing something obvious or simple. There is no direct bus from the Airport to Lake Bohinj. Having said that you already had the answer by yourself but maybe where looking at the wrong place. The bus from the Airport is going first to Kranj where you have to change to the bus to Bohinj. First Bus going to Kranj, second from Kranj to Bohinj. If you want to double check or just get times for the specific date you are travelling you can head over to the Alpetour's site and search in two steps first for the bus to Kranj and then from Kranj to Bohinj. On their site they refer to the airport as "Letališče Brnik" (Airport Brnik) which is the "old" name for the airport and also the nearest town Brnik. People in Slovenia are very friendly and helpful. Also most of them are speaking pretty good english, so you won't have any serious language troubles. Don't forget to look outside the window while travelling with the bus. The landscape at this part of Slovenia is one of the most beautiful, especially in spring! I found it easy to get around Slovenia on the bus, despite not speaking the language. We didn't travel directly from the airport to the lakes but got a bus into Ljubljana. The next day we got a bus from Ljubljana bus station to Bled, where we stayed for two days. Then we got another bus to Bohinj. After that we got another bus back from Bohinj to the airport. I think we had to change buses on the way back but that was straightforward - there are lots of signs and timetables at all the stations, and the drivers were pretty nice to us. Forgive me for not directly answering your question, I want to offer some alternatives to the particular solution you're seeking. To be honest you seem to have done most of the work to answering your own question already! First off, Ljubljana is a lovely city with things worth seeing and a decent nightlife, is there any reason you don't want to head there from the airport, spend a night there, then continue on to Bled (essentially use the Google-suggested route, but make it enjoyable)? How tight is your travel schedule? Secondly, I found Slovenia to be a pretty friendly country when I was there, so you might want to even think about hitch-hiking. There's quite a hitching culture in much of Europe, centered in particular on Germany, but I think you'd go well in Slovenia too. Depending on your personality (and their English! ), it can even be possible to make friends on the flight or at the airport, and score a ride with someone leaving the airport in your direction. I've saved myself the cost of a bus fare many times with this - all it takes is the courage to ask, or better yet approach strangers and ask. Finally, there exists a kind of middle-ground between road-side hitching and paid transport, the glorious Mitfahrgelegenheit, or its english equivalent, carpooling.co.uk. I'm not sure what your travel dates are, but my search turned up someone driving from Ljubljana to Kranj with three spare seats on the 11th of May. Not the answer you're looking for? Browse other questions tagged public-transport airport-transfer slovenia ljubljana or ask your own question.